In August of 1991 a crop circle researcher wrote 'TALK TO US' in the grain. In the middle of August in Alton Barnes in Wiltshire a peculiar inscription with unknown letters and language became visible in the flattened grain. 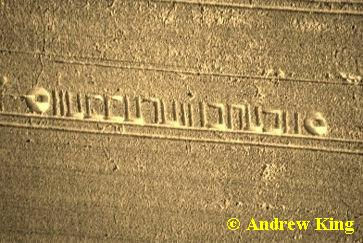 The English archaeologist, founder and president of the CCCS (Centre for Crop Circle Studies), Michael Green identified the letters as a form of Hebrew. From left to right it says; Phehthi or Ptah (the Egyptian god of creation) and Ea-cheche or Ea-Enki (the Sumerian god of wisdom, friend of the people). These are interesting facts but who are these Ptah and Enki actually? To be explain that we first have to know some more before we will to be able to understand the rest. Zecharia Sitchin wrote in 1976 in his book 'The Twelfth Planet' that, and I quote; 'Uranus was discovered in 1781. After having observed an unknown planet for 50 years, one figured out , with the help of mathematical calculations, how to localise this planet. Neptune was discovered in 1846. At the end of the 19th century it became clear that there had to be another planet that was disturbing Neptune and Uranus' orbit. The mystery was solved when Pluto was discovered in 1930. In 1986 images of Pluto were projected to us through the Voyager and it appeared that the planet was much smaller than one had presumed. But 'something' large was still disturbing Neptune and Uranus' orbit, but what was it? In 1978 astronomists from the Marine Observatorium in Washington were already claiming that Pluto was much smaller than what had been accepted until now. Pluto can no longer be seen as the only cause of irregular activities around Neptune. In 1979 Sitchin was told that astronomists were looking for a large planet. Astronomists have now been looking for almost 20 years !' ,according to my translation. This unlocalized planet is apparently three times larger than our planet. The orbit around our sun was also calculated. The rate of circulation amounts to 3600 years. Presumably this planet has past our sun around 200 B.C. This planet which is described in detail in Zecharia Sitchins books* is called Nibiru. The old Sumerians already knew of this planet and its inhabitants the Anunnaki, also known as the Nefilim (gods). In the eyes of the Sumerians the inhabitants of Nibiru were gods because of all their vehicles, weapons and knowledge. The leader of the first group of Anunnaki that came to earth was Ea. EA landed in the Persian Gulf 450.000 years ago. Ea means 'god of the waters'. After 'the flood' which was caused by the large gravitational pull from Nibiru, Ea became the authority over Egypt while his brother Enlil guarded over Mesopatamia. After 'the Flood' it was Ea responsibility to dry up Egypt again. his name changed to Enki. He did not change his name himself considering the fact that he had many titles and nicknames. This name was given to him. Enki means 'Lord of the Land'. Enki had a son named Thoth who was 'the Egyptian god of scientific knowledge, mathematics and the calendar'. He was the divine writer that kept up the books of the gods and the keeper of the secrets of the Pyramids. He was the god of the moon calendar while his brother Ra was the god of the sun calendar. Ra was Enki's oldest son. In Sumeria Thoth was known as Ningisjzidda while Ra was known as Marduk. Ra/Marduk's symbol was two snakes twisted around each other which he had taken over from his father Ptah/Enki. According to Sitchin the symbol of the two snakes twisted around each other is derived from the double helix of the DNA. Father Ptah/Enki was already involved with genetic manipulation then. Thoth/ Ningisjzidda was fully aware of these genetic manipulations of his father while Ra/Marduk, with his lust for power, knew much less about these. Ptah/Enki was responsible for the creation of Adam together with his halfsister Ninharsag who was a biologist and medical doctor. It was necessary that a 'human' was created because the gods work load was becoming too heavy. The 'human' could take over the heavy labour and therefore serve the gods. If we compare this story to the Bible and open it up the Genesis 1:26 the Bible becomes more clear than ever. In Genesis 1:26 it says; 'Then God said, let US make man in OUR image, in OUR likeness' To whom is God actually speaking? And who is this US? And to whom is being referred as 'God' . Could it be Ptah/Enki and Ninharsag who are actually responsible for 'our' creation, such as the actual translations out of the Sumerians state? Have there actually been genetic manipulations to intervene with the history of man? In reference to the above mentioned the finding of the crop circle formation on the 17th of June 1995 close to Alton Barnes is obviously rather striking. 4 Years previous to that finding the exact same inscription was once found close to Alton Barnes. This formation is called the double helix because it seems to be a reproduction of the DNA spiral. The odd thing is that to the question 'TALK TO US' the answer was; Phehti or Ptah and Ea-cheche or Ea-Enki, and haven't we just seen now that Enki and Ptah are one and the same 'person'? Ptah in Egypt and Enki in Sumaria. And isn't it odd that the same Ptah/Enki have kept themselves busy with genetic manipulations in the past? What's even more remarkable is that an extra hidden circle was found in the crop circle formation in 1995 close to Alton Barnes. Could this extra circle be the 'missing link' between the gods and mankind? Is that the extra piece of DNA that is responsible for the fact that we only use a small portion of our brain ? Did the gods alter our DNA compared to theirs in earlier times? And what is that extra bit of DNA? If we were to have it what would we be able to do? 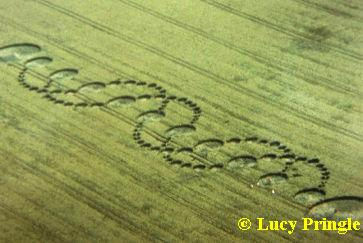 Would it be possible for us to decipher the cropcircleformations if we had that extra bit of DNA? Are the gods amongst us again and are they responsible for the various cropcircleformations? Is this their way, by means of cropcircleformations, to make something obvious to us?